Generally speaking, mid-February is the ideal time for pruning most shrubs, perennials, and ornamental grasses; but some plants are pruned later in the spring. So before you go Edward Scissorhands on your landscape, let's go over some specifics. The reason mid-February is the best time for major pruning is because usually our last freeze comes around mid-March (March 17). Three to four weeks prior to that time is the best time for pruning. Your plants have been storing energy all winter long. Pruning will stimulate new growth, so by the time the new growth comes, chances are the deep freezes will be a distant memory. Prune too early, and new growth could get burned by a late freeze. Late winter (January/February) is also a good time to prune trees, if needed. Just a note about oak trees (live oak or red oak), trim them very soon, if needed. To prevent the spread of oak wilt disease, the best time to prune oaks is in the winter months, preferably before February 15. 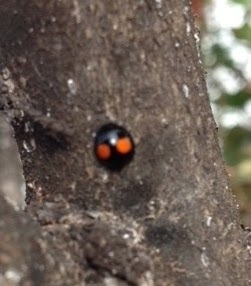 The nitidulid beetle is not as active during colder months. In the case of most shrubs, try not to just shear them, but instead selectively prune at intersecting branches toward the interior of the shrub to keep shrubs full and compact. If you only shear the tops of the shrubs, that is where the new growth will come, leaving the interior and lower branches bare. NOTE: Ideally, we want to plant the "right plant" in the "right place." Choose shrubs based on the mature size of the shrub and the available bed space. Applying the "right plant/right place" philosophy to your plant choices will keep your pruning chores to a minimum each year. If we try to force large shrubs into small beds by pruning them heavily every year (or month), it just adds unnecessary work and expense, and eventually the plant's health will decline. Drastic restorative pruning can be done on shrubs that have gotten very overgrown or have been poorly pruned in the past, but it's best if this is only done for a year or two to get the plants back in shape. Hollies (e.g., Yaupon, Burford) can take pretty drastic pruning, by 1/3 to 1/2 of the plant. Ideally, if they are sited in the correct space for mature growth, you will not need to prune this severely every year. However, if they have gotten overgrown or have been poorly pruned in the past, don't be afraid to do this drastic restorative pruning. Within a month, they will be lush with new growth. Dwarf Yaupon Hollies do respond well to shearing, but when pruning this shrub, aim for a "dome" shape instead of a "meatball." Shape the top of the shrub, but do not cut in at the bottom. The end result is that the shrub is wider than it is tall. Nandinas: All varieties of Nandinas are always pruned at the bottom. Never prune the sides or tops. Take the tallest canes, follow them down to the ground, and prune them. New growth will come out at the point of pruning, keeping the plant full and compact. Try not to prune more than one-third of the shrub at once. Abelia: Abelias have a naturally weeping shape and do not look good when pruned into a square or ball. Smaller varieties of Abelia (such as 'Rose Creek' or 'Kaleidoscope') can be sheared into a dome shape, but ideally allow them to grow in their natural form. All varieties of Abelia tend to put off long straight shoots that can be pruned off, if desired. Prune those longest stems close to the ground to keep a more tidy appearance. Larger varieties (such as 'Edward Goucher' or 'Glossy') that are very overgrown or have been poorly shaped in the past can be pruned down to about 18 inches. They will be just sticks at that point, but they will regrow into their natural weeping shape and will not need this drastic pruning again, provided their mature size fits the bed space. If the mature size is too large for the bed space, replace with a smaller variety of Abelia. Cut Miscanthus and Fountain grasses down to about 3 inches. It is not necessary to cut Mexican Feathergrass; just give it a “haircut” and rake out the old grass stems. Cut Muhly grasses down to about a foot tall and rake out old stems. Roses: Prune shrub roses back by about half their size in mid-February. First, prune out all dead wood and any stems pointing toward the center of the rose. What you want left is a clean center with all stems fanning outward. Then follow the stems down until you find a leaf node (bud of new growth) pointing to the outside of the rose (not back toward the center) and prune it at a 45-degree angle right above that outward facing leaf node. Prune carpet (drift) roses back by two-thirds. Prune climbing roses selectively, just pruning stems that have gotten out of hand, just tidy it up a bit. Prune spring bloomers AFTER they bloom. As your roses start to put on new growth this spring, be on the lookout for Rose Rosette Disease. Symptoms of RRD present as red, distorted new growth (known as "witches' broom") on long, thick, extremely thorny stems. The disease is transmitted by a microscopic eriophyid mite and is spread to other roses as the mite travels on wind currents. At this point in time there is no effective control of the disease, and it is recommended that any roses with RRD be completely removed and destroyed. Click here to learn more. As I mentioned before, some plants are pruned later in the spring. Spring-blooming shrubs produce flower buds for the spring during the previous autumn, so you will need to wait until after you enjoy the spring blooms to do any pruning. 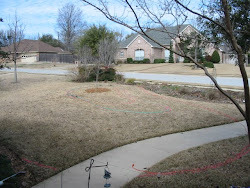 If you prune in February, you will cut off all the blooms. Indian Hawthorn, Viburnum, Forsythia, Flowering Quince, Loropetalum, and Azalea fall into this category. They will be ready for pruning probably about April. Hydrangeas bloom on old growth (last year’s growth), so pruning them now will sacrifice blooms. If you need to prune them, do so right after they finish blooming. Selectively prune by cutting the tallest stems close to the ground. 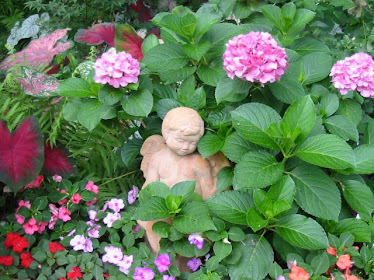 'Endless Summer' Hydrangeas are an exception to this rule (they bloom on old and new growth) so if necessary, they can be pruned now. Spiraeas: Prune Bridal Wreath Spiraea after it blooms, cutting tallest stems close to ground only if needed. It does not need to be pruned at all; it has a lovely weeping shape. Anthony Waterer Spiraea and Lime Mound Spiraea, however, can be pruned in mid-February; prune back by about half to keep more full and compact. Crape Myrtles: Please do not prune the tops of crape myrtles - a/k/a "Crape Murder." Prune only dead or crossing branches and any suckers that have grown at the bottom. If your crape myrtle does not leaf out well this spring because of previous winter freeze damage or if it is disfigured from past "crape murder," cut the tree TO THE GROUND and let it regrow. It will quickly send up new shoots, and at that point you can pick the strongest stems to become the new tree. If you are unsure whether a branch is dead or alive, make a small scratch in the bark. If it is green under the bark, it is alive. If it is tan or gray under the bark, it is dead and can be pruned off. 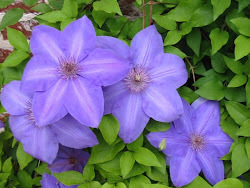 Groundovers: Asian Jasmine, Purple Wintercreeper, and Mondograss -- mow or weed-eat down to 3-4 inches. Liriope -- weed-eat or cut down to approximately 2 inches. New growth will emerge in March. Now for my favorite subject.....Perennials! Some perennials can be pruned after freezes in the fall (see tips in this post Is it Dead or Dormant or in Fall Newsletter). If you did not prune your perennials last fall, here are a few specifics to get them ready for spring. · Salvia greggii or Salvia microphylla (Hot Lips) – cut down to about 6 to 12 inches. It will stay more compact/full. · Shrubby Pink Skullcap - if there is not a lot of freeze damage, just give plant a haircut, taking off only a couple inches to make it look neater. If freeze damage is severe, cut to ground. · Blackfoot Daisy, Calylophus – these plants do not respond well to severe pruning. Give them a "haircut" now, but wait till new growth appears to determine if you need to cut back more. Blackfoot Daisy may need to be replaced; it can be cold tender. · Purple Coneflower, Black-Eyed Susans, Fall Aster, Mealycup Sage, Mexican Mint Marigold, Hardy Hibiscus, Mexican Bush Sage, Summer Phlox, Turk’s Cap, Loosestrife, Zexmenia, Catmint – cut to the ground. · Lantana – Cut back to about 3 to 6 inches. It is slow to come out in the spring, so don’t give up on it. · Russian Sage – You can cut it back to the ground, but I like to cut back to about a foot tall for stronger stems to support the blooms. · Four-Nerve Daisy - cut away old blooms and any browned foliage. · Liriope (variegated or green "monkey grass") – cut back to about 1-2 inches. · Butterfly Bush (Buddleia) and American Beautyberry - Cut back to about 12 to 18 inches. · ‘Powis Castle’ Artemisia – cut back to about 6 inches. · Ferns – Wood Ferns and Japanese Painted Ferns - cut to the ground. · Cast Iron Plant - cut tattered or browned leaves to the ground. It is slow to grow back; be patient. · Ligularia/Farfugium (Leopard Plant), Lamb's Ear - cut away any browned leaves. 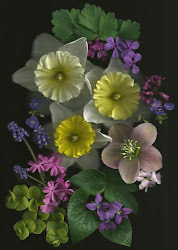 · Columbine - only cut away dry, browned foliage. It should be sending up new growth right now; be careful not to cut new foliage. Once we have had our last freeze and before your grass starts to green up, you can scalp your lawn (early to mid-March). This will be the ONLY time you will scalp your lawn. Scalping is done by lowering the mower to the lowest setting you can still push your mower. (Note: Don't set your mower quite that low if you have St. Augustine - just drop it a notch or two to remove brown stubble.) Throw the clippings in the compost pile. In a cool, wet spring you may see fungal problems appearing in your St. Augustine lawns (Take-All Root Rot TARR.) Spread ½ inch layer of peat moss over the area. LAWN WEEDS: Applying pre-emergents in September is the time to treat for spring weeds (refer to Fall Newsletter for details). If you are overrun with weeds in your lawn right now, most of them are spring annuals that will burn out as it gets warmer (chickweed, henbit, poa annua). Mowing often, fertilizing on schedule, and watering deeply but infrequently will solve most weed problems as your turf grass gets healthier. ORGANIC: If you want to use the organic version of “weed and feed,” use Corn GLUTEN Meal in your lawn areas. CGM is also a source of nitrogen, so if you go this route, you do not need to use additional fertilizer for your lawn (you will need organic fertilizer for your shrub/flower beds, though). Corn gluten meal goes down at the rate of 20 pounds per 1,000 square feet, as well. Using the powder form of CGM is more effective for weed control than the granular, spreadable kind. Do not put corn gluten meal in any flower beds where you want seeds to germinate. NOTE: Excessive moisture can reduce the effectiveness of CGM, so it is best to apply it when there is no rain forecast for a few days. Apply, water it in lightly, then do not water again for several days. Synthetic pre-emergents MUST be applied during the first 10 days of March in order to be most effective against summer weeds. A second application will be made in early June. Follow product labels as directed for application rates. For annual GRASSY WEEDS such as crabgrass and grass burs, apply Scotts Halts or Dimension Crabgrass Preventer. Water only lightly after applying. I would caution you to NOT use chemical weed-and-feed products. Read product labels. The herbicides in weed-and-feed products can damage shade trees. Late March/early April is the time for the first fertilization of the year. Put fertilizer down at the rate of 20 pounds per 1,000 square feet on lawns and all flower/shrub beds. This is the application rate for ORGANIC fertilizers. If you are using synthetic fertilizers, follow the application rates on the bag. Water well after applying fertilizers. Another way to fertilize your lawn is to spread a thin layer of compost (1/2 inch) over all lawn areas. This is a little bit labor intensive, but you will get great results. Use the compost in lieu of organic fertilizers; you do not need both. I usually compost my lawn about two weeks after scalping. Click here to see more pictures. If you planted pansies and/or kale last fall, they should still be doing great right now. They should last through March when it starts to get warmer. It is too early to plant summer annuals, but start planning what you’d like to plant so you can be ready to plant after freeze threats have passed (after March 17). Click here for lists and pictures of great heat-tolerant annuals for your spring/summer beds and containers. If you planted wildflower seeds last fall (Larkspur, poppies, bluebonnets, etc. ), they have probably already germinated or they will soon. Just water them as you would the rest of your garden (once every week to two weeks, depending on rainfall). They will start blooming the end of March, through April and May. Late May they will start going to seed. If you want to collect the seed, you will need to let the plants completely turn brown and dry. You can then collect the seed and pull the old wildflowers completely out. They will not regrow from the root; only from seed. Scatter the seeds back in your flowerbed, or save them to plant in the fall or share with friends. BULBS: If you planted bulbs last fall (daffodils, grape hyacinth, species tulips, byzantine glads, leucojum), they should be popping out of the ground right now and will begin blooming late February and into March. After the blooms fade, you can remove spent flowers, but leave the foliage intact, allowing the leaves to die completely before removing (at least six weeks after blooms fade). Those leaves are producing and storing energy (sugar) for next year's bloom. As you are pruning your shrubs (especially golden euonymous and occasionally hollies) you might notice the undersides of the leaves are covered with a white "substance." This is an insect called scale. Treat with dormant/horticultural oil, spraying the tops and undersides of the leaves. Euonymous shrubs are scale magnets! I would encourage you to replace them with a better quality shrub. 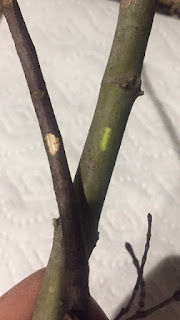 Scale on Crape Myrtles: Crape Myrtle scales are aggressive, sap-feeding insects that appear as white, waxy encrustations most likely to occur near pruning wounds or in branch crotches. Larger female scales "bleed" a pink liquid when crushed. For severe scale infestations (as pictured above), you may have to resort to treating with Imidacloprid. One brand is "Bayer Advanced Tree & Shrub Protect & Feed." The Bayer product is a granular systemic insecticide that is sprinkled around the root zone of the tree in late May or early June and gives 12 months of protection. Follow label directions. Nurseries will soon be fully stocked. Spring is a great time to get plants in the ground to get them established before the heat of summer. Fall is the absolute best time to plant, but early spring is the next best. 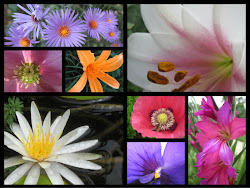 Click here to learn about all of the plants that thrived in my garden during the record-breaking Summer of 2011. Before you plant or transplant anything (except trees – see link below), be sure to add lots of compost to the planting area. If you have heavy clay soil, add expanded shale, as well. Make sure the soil/root ball is very moist when planting (soak with liquid seaweed root stimulator prior to planting), and keep soil moist until plant is established. Now is a good time to divide overgrown perennials and transplant them to another spot. If you’ve got too much of a good thing, plant the extras in a pot, give them to a friend, or donate them to the Grapevine Garden Club and we will sell them at our annual Plant Sale on Saturday, April 13 . 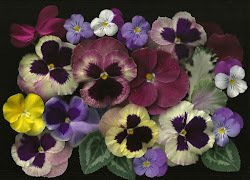 If you need new plants, this is a great way to get heirloom plants at very inexpensive prices!! Mark your calendars! Now is also a good time to transplant shrubs, if needed. January is the best time to transplant trees while they are dormant, so if you need to do that, transplant very soon. Click here for my tips on planting trees. In the winter and early spring, supplemental sprinkler watering is only needed once every two-weeks, if we have not gotten any rain. If the forecast calls for a hard freeze, be sure your soil is moist down to 6 inches (run sprinklers if we haven’t gotten a rain recently). Once we get into the growing season, follow your City’s water restriction schedule. Watering is usually limited to twice a week between 6 p.m. and 10 a.m. It is best to water deeply and infrequently to encourage deeper root development. 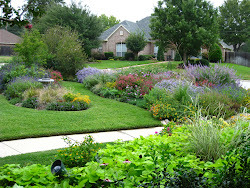 Twice-a-week watering should be sufficient for most landscapes (and even less for true xeriscaped gardens). Watering more frequently develops shallow root systems and just sets your landscape up for failure when water restrictions are enforced. The best tip I can offer is to use the "cycle and soak" method. Run all zones of your sprinkler system, wait 15 to 30 minutes, and then repeat the cycle again. This will allow the first cycle to soak into the soil before you run the system again. This requires either a Program A and B or multiple start times on your controller (or manually restarting the system). If at all possible, do not water at night. Dark and wet = fungus! It is best to water early morning. Water container plantings as needed. Mulch all bare soil to conserve moisture and keep the weeds to a minimum. I prefer native cedar or hardwood mulch, but anything is better than nothing. Please don’t skip this step; it is very important. Be careful that you do not pile mulch up on the trunks of trees or shrubs. For a quick way to heat up your compost pile, add some cottonseed meal. You can purchase it inexpensively at feed stores or most garden centers. Saturday, April 13, 8 a.m. to 1 p.m.
Sunday, May 5, 10 a.m. to 4 p.m.